New England Patriots tight end Rob Gronkowski spent part of Thursday in a Boston hospital getting treatment on his injured right knee which included an injection, according to a source familiar with the procedure. The Patriots believe Gronkowski will play in Saturday's divisional-round playoff game against the visiting Kansas City Chiefs, but will ultimately need to see how Gronkowski feels on game day. Gronkowski practiced on Monday but was held out of Tuesday's session, which was done in full-pads. Yesterday, he was a limited participant, and today he was held out altogether, and we now know why. Even if the Pats believe Gronk will still be good to go in Saturday's game against the Chiefs, the fact that #87 is getting an injection two days out from the start of the postseason is seriously alarming. 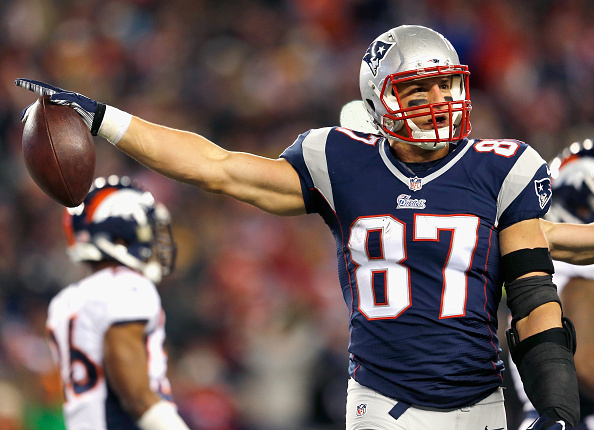 Gronkowski suffered his knee bruise/strain to his right knee back on November 29 in Denver. He missed the following week's game against the Eagles but returned against the Texans in Week 14. After that, Gronkowski was a defacto decoy in the Patriots offense, as he was targeted just 24 times in the last three games of the season. The tight end caught 11 of those targets for 158 yards and hauled in just one touchdown. With the concern over the health of Julian Edelman, the bizarre episode involving Chandler Jones, the black eye worn by head coach Bill Belichick and now the hospital visit and subsequent injection to the knee of Gronkowski, and very suddenly things just feel a bit off heading into the matchup against the Chiefs.